Nothing says O-L-D like an apartment furnished with a walker, a shower bench and a commode. And is that a cane lurking in the corner? Right now, it’s all necessary, but every day, I remind myself all this is temporary. 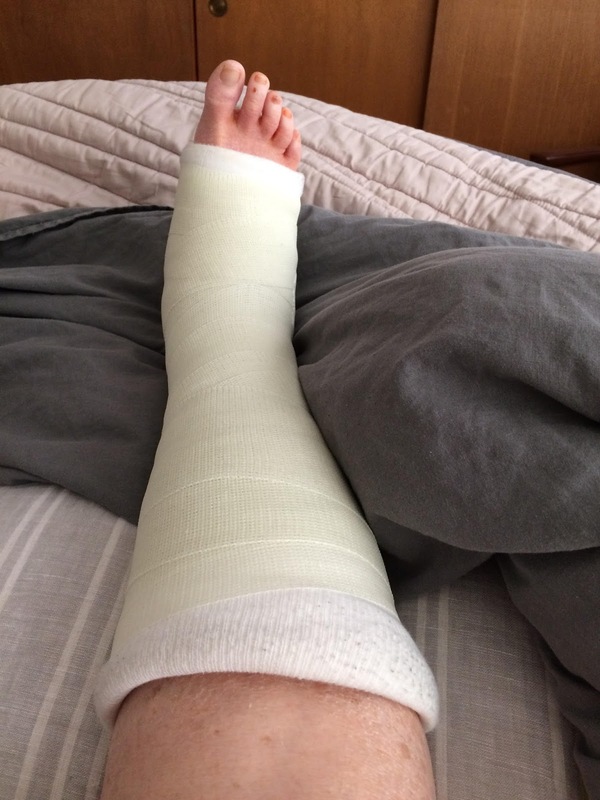 Two months ago I had surgery for a ruptured Achilles tendon. After three weeks in an orthopedic rehab center, I came home. Because the doctor has not yet given me permission to put full weight on my right leg, I am housebound. The biggest consolation is that I really like my apartment. Also, I am somewhat comforted to learn that even famous folk have experienced the long recovery that follows this surgery, including Judi Dench, George Clooney, Kobe Bryant, David Beckham and Dwayne “The Rock” Johnson. At least I‘m not looking to return to a career in professional sports -- I just want take my grandson to the park! Before surgery, friends who have been here and done this provided moral support and practical survival tips (thanks, Lorilee and Kenny!) and I found more good advice on line. Now, of course, I have personal experience to pass on as well. Here are some useful guidelines for anyone recovering who lives alone or whose spouse or partner is away at work all day. Get the Equipment You Need. Walkers, shower benches, commodes and wheelchairs are known as “durable medical goods.” Ask your surgeon what you’ll need at home and then ask your insurance company what they cover and what it will cost. For a fee, my Medicare plan provides some durable medical goods, but on their schedule, which did not match mine. So I got brand names and model numbers off the equipment at the rehab center, and my son ordered the basics from Amazon. Medical supply stores sell it all and may offer some equipment for rent. Though knee walkers were readily available, the seated, steerable, non-motorized scooter my physical therapist recommended for me was not. I rented one from Cloud of Goods (www.cloudofgoods.com/), a company based in San Francisco, Calif., that also provides wheelchairs and scooters to grandparents visiting Anaheim who discovered they could not comfortably walk around Disneyland after all. Some nonprofit organizations make durable medical goods available free (or for a small registration fee) if you can’t afford to buy them. Look on line for an organization in your area. Another possible source is your neighborhood’s FaceBook page or CraigsList. 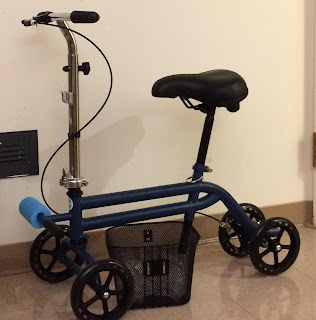 After posting a plea, a friend recently scored the loan of a knee walker from a neighbor who had one stored in his garage. Get the Help You Need. If your surgeon declares you housebound, find out whether your insurance company will send a visiting nurse, a physical therapist and an occupational therapist to your home on an as-needed basis. Some insurers also provide home health aides to help you shower, do the shopping or tidy up the kitchen. If yours does not, plenty of agencies offer this service. Most insist on a minimum four-hour commitment, but I found one willing to send an aide for two hours. Either way, make a list of tasks that need doing so you don’t pay someone to sit and visit with you. Because I couldn’t navigate the seven steps at the entrance to my apartment building, at first I had no idea how to get to the follow-up appointment with the surgeon. The solution? I hired a non-emergency medical transport company, which provided a small wheelchair, a van altered to accommodate the chair and a ramp to make it all easy. The cost was $65 round-trip, far more reasonable than a local ambulance service. Transform Your Living Space. Making your way around your home in a wheelchair or on a scooter requires clear paths. While I was at the rehab center, my son and daughter-in-law rolled up the area rugs, pushed back the dining room table and chairs and moved my bed. A raised tile floor in the doorway to the bathroom was impassable until my son devised a ramp from my plastic desk chair mat and a flattened cardboard box and then secured it with packaging tape. Perfect! 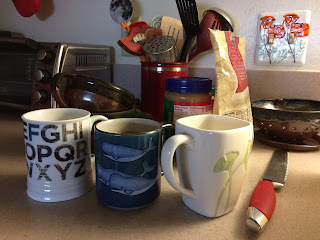 In my small galley kitchen, I can easily transfer food from the refrigerator to the microwave or toaster oven and then onto the nearby table. Also, I keep clean cups, glasses and plates on the kitchen counter. The peanut butter jar, a package of granola and a bread knife are there too. In the fridge, the fruit and milk I reach for most often are front and center. In the bathroom, I keep fresh washcloths, towels and extra toilet paper rolls all within easy reach. Do One Thing at a Time. 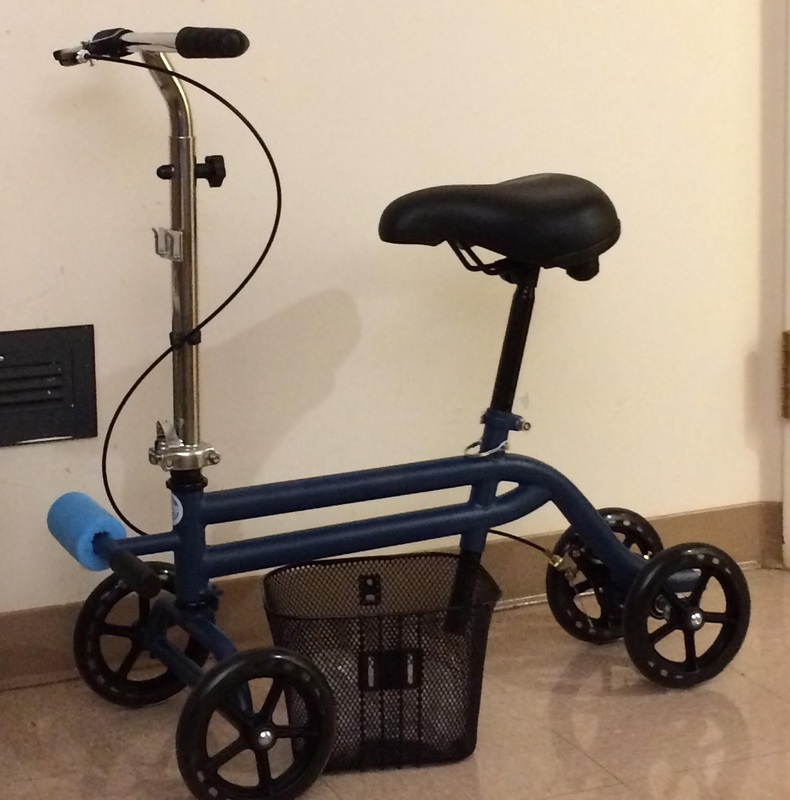 “When you’re getting on the scooter, don’t think about where you are headed or what you plan to do next,” cautioned the physical therapist at the rehab center. “Concentrate on one thing: getting on the scooter safely.” He was right. This is not the time to multi-task, as you could put yourself at risk of falling. Will everything take longer than you expected? Yes. So? That’s not to say you can’t prepare for your next destination, even if it’s just the couch. My scooter came with a basket but it interfered with my cast, so I hung a tote from the handles. 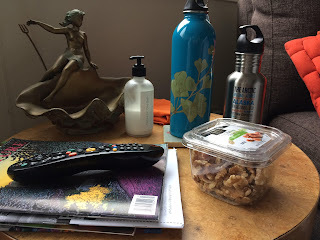 In it, I can easily transport my phone (always keep it with you, in case you need to call for help), my Kindle, a snack and the three refillable water bottles I place near the places I spend the most time. Manage Your Expectations. Everyone’s recovery is different, but if you have the use of just one leg, you won’t be able to do everything you might want or expect – especially at first. Plus, you likely will tire easily, as you won't have a lot of stamina until physical therapy helps you get your strength back. The solution is twofold. First, lower your expectations. Then call in favors from family, friends and neighbors. Don’t be shy – most people are flattered when asked to help someone in need. 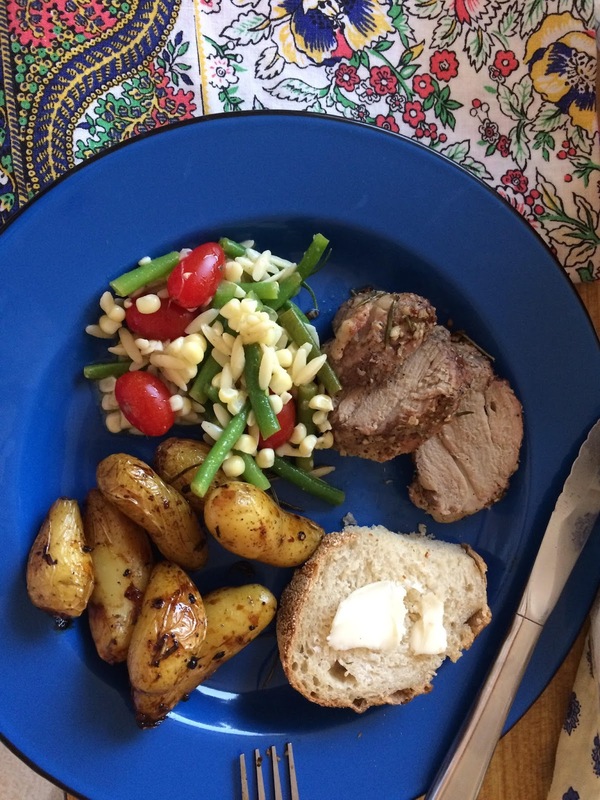 Some will prepare and deliver occasional meals. Some will provide gift certificates for meal delivery services or offer to bring you a frappuccino, a smoothie or even a pizza from your favorite place. Others will happily unload (and then reload) the dishwasher, bring in the mail or do your laundry – or drive it to the nearest wash-and-fold establishment and then return it to you. Friends also can do your grocery shopping. I recommend stocking up on tuna, yogurt, apples, bread and cheese. If you need a lot of groceries and are especially picky, you can order delivery on line from your favorite store where you know what’s in every aisle. With each selection, my store’s delivery website has a place for a personal note. “Firm bananas,” I write, “with no freckles.” So far, so good. Find Fun Things to Do. While you sit around with that leg elevated, play Scrabble on line, read the classics, call out-of-town friends, watch old movies, research your family history, organize your photos (those on line and in the box in the closet), write sweet notes to people going through challenging experiences different from yours, order something indulgent (maybe a jar of cherry jam from Michigan?) or plan a vacation for next year. Or nap – you have an excuse! Nothing Lasts Forever. Conventional wisdom is that the recovery period after Achilles tendon surgery can take a year or even longer, especially if you hope to get back to long-distance sprinting. (I do not.) Yes, some days and nights drag, but I’ve learned to concentrate instead on how far I’ve come, from sucking on ice chips post-op to shuffling around the apartment with a little help from my walker. And when the present moment is really difficult, I imagine myself in the months to come, walking and happy – and somehow younger.